Just a group shot of all six BG mane six Elements of Harmony. Mostly for the ease of reference. It still kind of bugs me that Scratch's and Time Turner's elements are largely the same color, but the only alternative I can easily consider is doing Scratch's element in red. And that won't work. We all know her eyes aren't red. Here's an idea for an element how about the Element of Wisdom? Say, I'll bet you can make a set alternate universe elements if I show the AU 6 design. I created them in Inkscape! what elements are these pleas tell me?? I need the Doctor to have the "Big Crown Thingy" for my fic at www.fimfiction.net/story/21423… to work, can you redo them? Did you commission these or something? No. I just want to share my art and need someone else's help. Ah. I meant story creation by "art" and was unaware of the necessity of permission... I plead not guilty! Now all I need is for somebrony to make a pic with the hourglass in the crown. I don't care what the colours are, I will edit them to my liking. Just make the crown, somebrony! Anybrony! I always thought Dr. Whooves would have been the element of magic since he's a time traveler. Ya know. 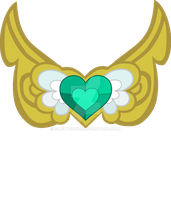 Doctor's element could be used by Minuette as well. Her coat and mane match the blue, she had an hourglass cutie mark, and she's female. Still doesn't even the races though. her eyes are Moderate Cerise (and if you don't know what that is) rainbow's eye color, not red. ...We aren't talking about rainbow. now you guys can argue about what voice vinyl will get in rainbow rocks. I know, but someone said that Vinyl's eyes AREN'T RED. Thank you for proving me right, infact its in the description, this guy doesnt think they're red. Actually, no, they're hot pink. Go watch Equestria Girls. In the cafeteria song, RD takes off Vinyl's glasses. THEY'RE HOT PINK. You're very, very stupid. You need to go see an eye doctor or jump off the golden gate bridge. You could've done Vinyl's magenta. RD already has loyalty...... how bout tolerance for bonbon? She does put up with Lyra's craziness, after all.